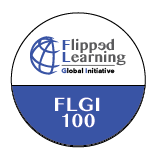 Sara Wilkie posted a Flipgrid question — From 1:1 to 1:World. This is a concept Alan November has written much about and is an important conversation for us all to be talking about. So I was happy to see that Sara has opened up the discussion for us! As I thought about what I wanted to say, I realized how many thoughts were flowing through my head. So I decided I’ll put some of my ramblings into a blog post. Much of this is just my ramblings… not formalized… things I’m still thinking over and exploring. I think the power of having a global voice and audience really struck me when I started making my flipped classroom videos. The process of putting my videos online for the world to see has allowed me to experience the wonder of having my voice reach way beyond my immediate classroom. Math, being a truly global language, has allowed students from around the world to learn from my videos. The internet is an amazing place and students turn to YouTube or an internet search immediately when they are looking to learn something new. I’ve wanted my students to experience this same feeling and ability to contribute beyond the walls of our classroom. Part of my course syllabus actually specifies that: beyond contributing to discussions and staying on task, a major component of class is helping others work through challenges, near and far. In addition, I ask students to create mini video lessons of their own. We often simply use Flipgrid to make the process of creating quick video explanations even easier. (See more: Using @Flipgrid in Online #APCalculus to Allow Students to Verbalize Their Thinking Process.) Instead of students doing a bunch of problems and submitting a piece of paper to just me, with Flipgrid, they are able to contribute their answer to a “grid” of video responses and see/hear the responses of their classmates. There is huge benefit in peer-to-peer learning, and Flipgrid is a simple way to set up a powerful teaching/learning/and sharing opportunity. What’s more, as the teacher, I have a chance to hear the student’s process of solving a problem and gain such valuable insight into their approach and reasoning. Right now, my Flipgrid discussions have not reached beyond my immediate class. I would say that I have used Flipgrid mainly in the process of students learning new material, so I’ve wanted students to feel comfortable making mistakes and therefore have kept the board private and closed to my class. However, I have some ideas for expanding these activities this year, and this discussion prompt reminds me to take a deeper look at this chance to connect my students with a world of learners. Stay turned for more ramblings on this in the coming months! It’s amazing what technology can do to help us connect our students to a global and authentic audience. And as a math teacher, having students chat about math and contribute to solution forums, they are required to verbalize their math thought process and dive deeper into connecting concepts. Not only does this do wonders for solidifying concepts and helping them understand the why behind their solution, I think it helps students think differently about math class. If the first thing a student mentions when you ask them about their math homework is that they’ll be completing a worksheet with 101 questions – well, it’s no wonder those students dread doing that work. Yes, repetition and practice is necessary in math class; but, if we shift the way we have students talking about their math work and give them more chances to chat out their solution process, we can help students more quickly and deeply grasp complex concepts. Finally, all of this student sharing allows for powerful peer-to-peer learning on a global scale. Many times, hearing a peer explain a solution is more helpful than hearing the “expert teacher” re-explain the topic. Students tend to get stuck in similar areas and – since they are learning together – there is a certain level of empathy that a student-to-student explanation can provide that can’t be matched by the teacher. If you have a moment, jump in on the From 1:1 to 1:World conversation on Flipgrid!